I was pleased to be asked to give a talk about Aurora’s Baltic travels, to the Cruising Association at their headquarters in Limehouse basin in London’s East End. Enthusiastically assisted by Alice, the talk to an audience of forty or so was very well received. I described the modifications I have made to Aurora, the preparations for our cruise, the island groups we visited and the contrast between Baltic cruising and sailing in home waters. I’ve been asked to give this talk again, closer to home this time. This one will be for the West Midlands section of the Cruising Association on the evening of Nov 17th at Ashwood Marina Social Club, Kingswinford DY6 0AQ. All welcome. 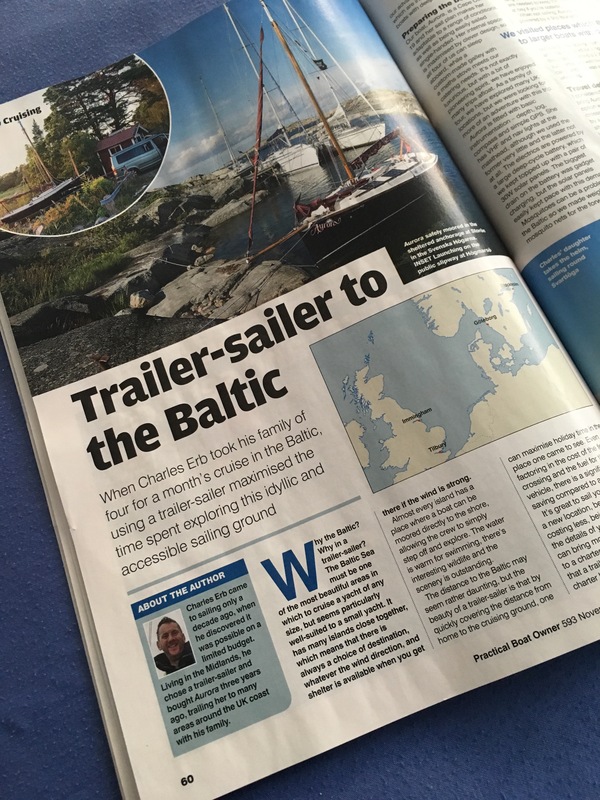 The journeys in this blog have made it into print again, this time with a feature in Britain’s best selling Sailing magazine. 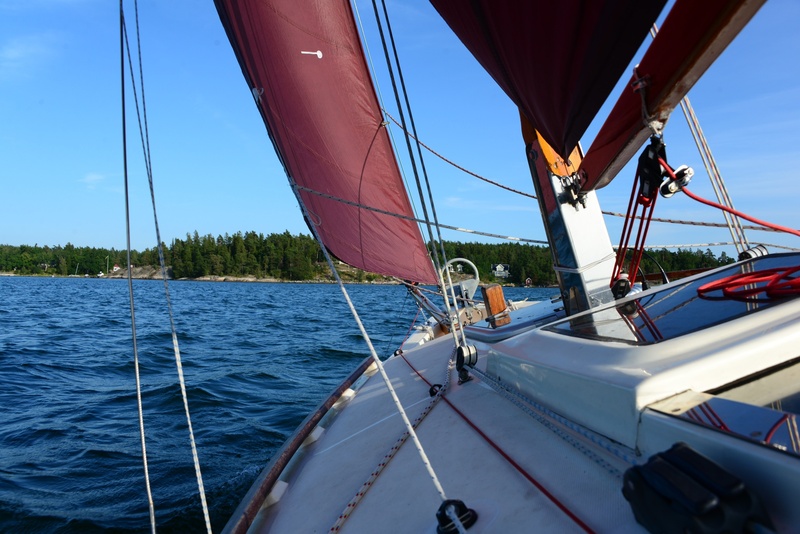 The article in the November edition of Practical Boat Owner covers our month-long cruise around part of the Stockholm archipelago in the Baltic during the summer of 2014. With the Autumn leaves falling, the nights drawing in and the temperatures falling, it’s lovely to look back over wonderful summer memories. I’m giving a talk to the Cruising Association next Friday. If you’re in London next weekend, you’d be welcome to come along. 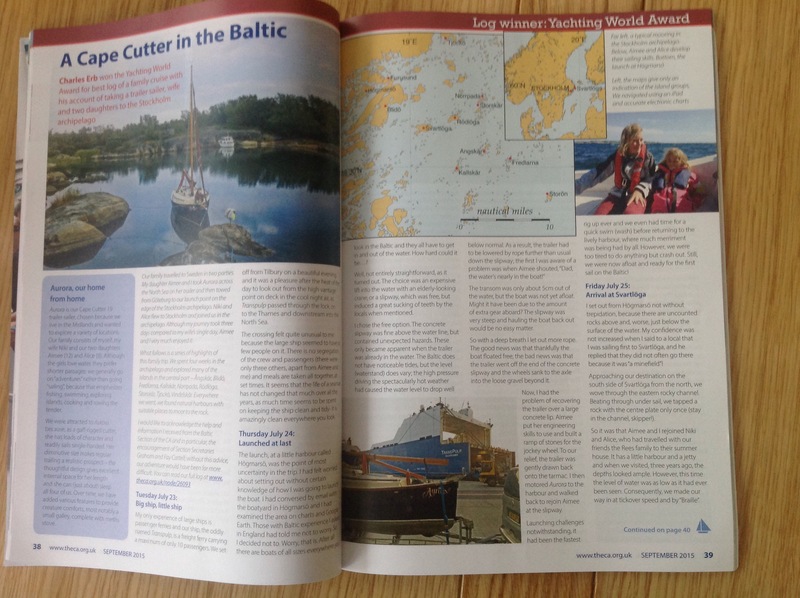 I was delighted to learn last week that my log of our Baltic trip last summer has won an award from the Cruising Association. 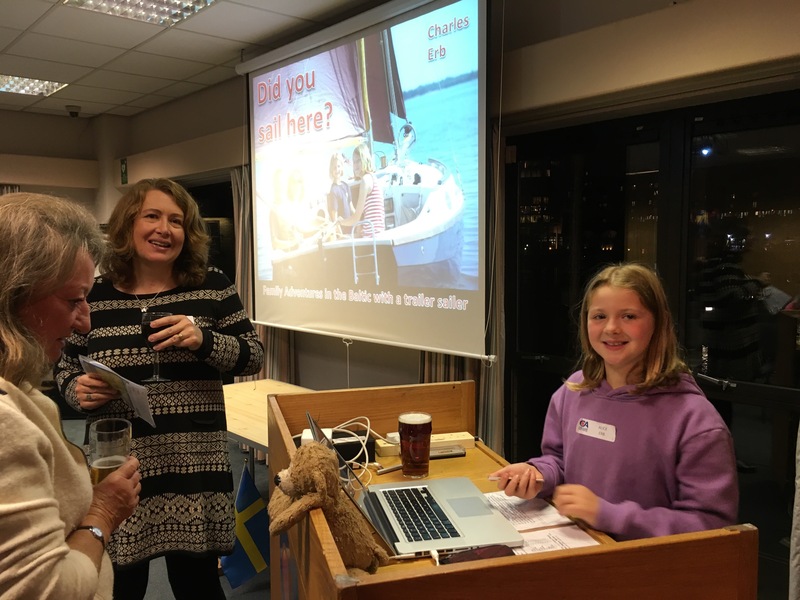 They have a well-subscribed competition each year for cruising logs and I put forward my record of our lovely trip to Sweden. A wide variety of trips were represented in the competition, with destinations near and far, but I think what we did had something different. It was great fun working my log entries up into a single document and I think I might use it to make a photo book. I have put together a video of our wonderful trip this summer to the Baltic. Whilst my main photographic interest is still photography, and I am very pleased with a number of images I made in Sweden, I decided that video conveys something extra. Throughout the trip I took video clips on my iPhone- I decided to stick to 10 seconds for each clip. I’m not much of a videographer and I think I’ve shot too many sweeping pans really. I have had lots of fun editing the movie- I used Pinnacle Studio on my iPad to make it and have been very pleased with the results- so much more portable than using a desktop or laptop. The software is surprisingly powerful, given the platform it runs on, but the main benefit is being able to edit on the go. The quality of the rendered video is quite pleasing, but YouTube has degraded the quality a little- looks best if you can watch the HD version. I write this as I travel back to Blighty across the North Sea aboard Transpulp from Gothenburg to Tilbury, at the end of our cruise around (a part of) the Stockholm archipelago of islands. We have sailed over 280 sea miles aboard Aurora on this voyage and I feel that, living land-locked in the centre of England, we have made the most of a trailer sailer. Everywhere we went in the Baltic, people asked us if we had sailed across from England. To me, the point of a trailer sailer is to be able to get the boat quickly to the cruising grounds; the Cape Cutter is not ideally suited to long passages and that is not the type of sailing the family enjoys. 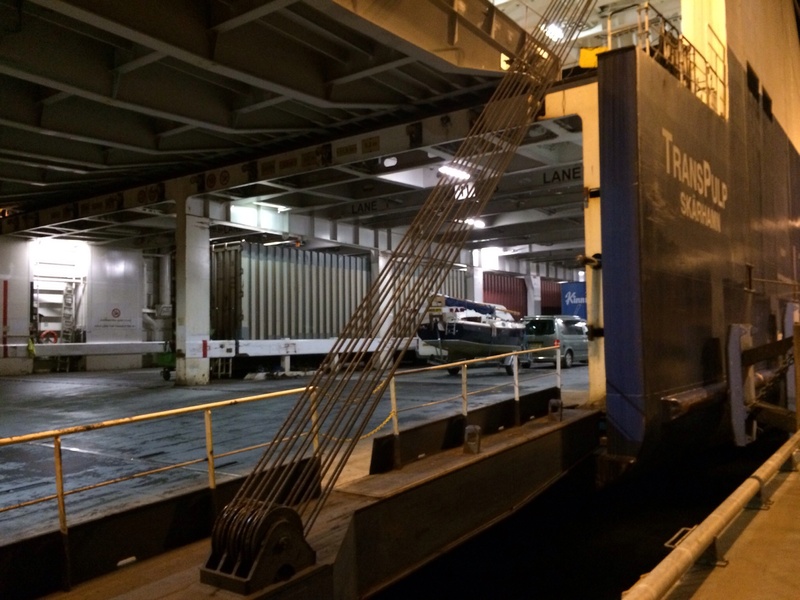 The driving was not excessive, most of the miles travelled at ease on the cargo ship. We have been lucky with the weather- moderate to light winds and much sun. It seems that my insurance policy of having a rain cover made has paid off, as we had little rain and much of this was at night. Aurora attracted admiring comments wherever we travelled and we saw few boats as small as us. The Cape Cutter 19 is not an ideal design for the Baltic, but we managed very comfortably. Our bowsprit meant that it was hard to get close to the rock, as did the vertical bow. On the other hand, it is easy to raise the bowsprit when necessary. Our shallow draught gave us access to locations inaccessible to larger yachts. 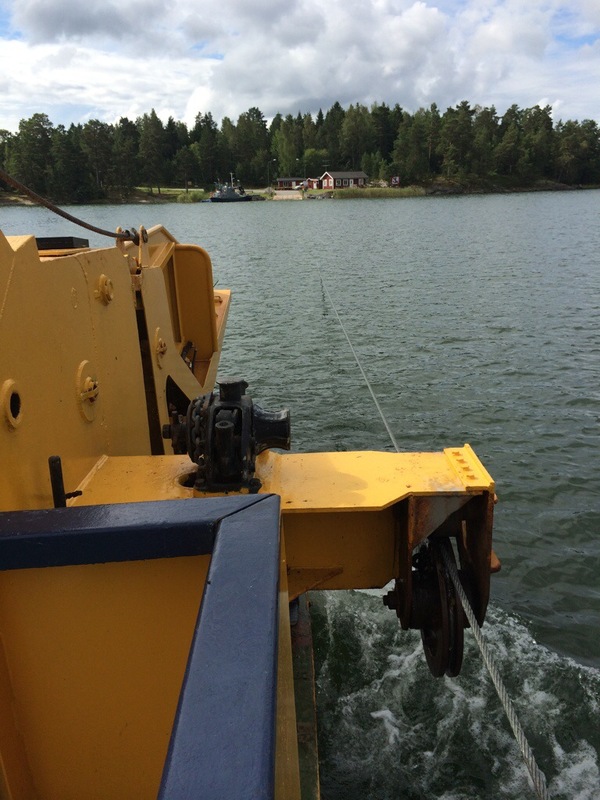 Mooring in the Baltic is done bow-to, with warps ashore and a stern anchor. Baltic boats have a pulpit modified to allow for getting on and off the boat and many have a ladder too. A stern anchor on a tape is also usually used; we did not carry a second anchor. This was partly because I was worried about storage space, but also I was worried about the holding of a small enough anchor to stow aft. It was easy enough to move our anchor aft when needed; later on in the trip, I tended to lay the anchor from the bow and then walk the warp to the stern. 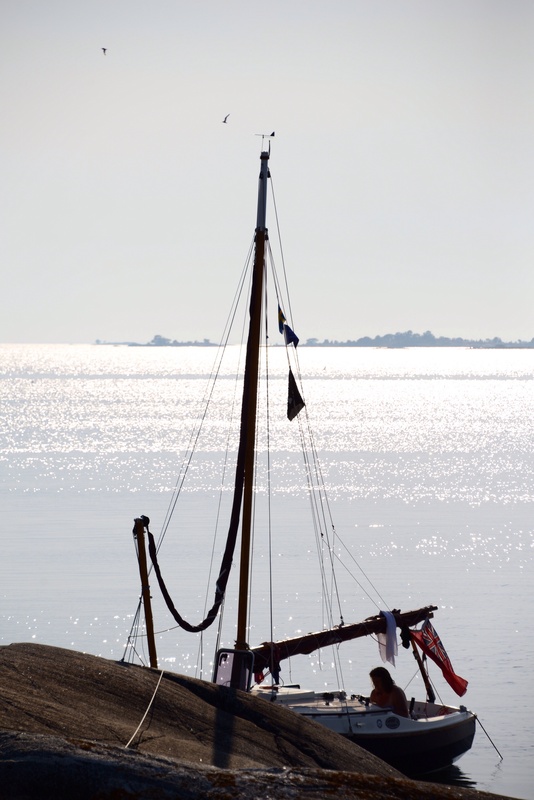 Anchoring is done in this way because it makes it easy to get ashore and because many harbours are narrow with nearly vertical rocks and little for the anchor to grip. This means poor holding and not enough room to swing at many of the nicest harbours. With no tide, why would one not want to simply step off the boat onto land. We managed well for power, thanks to the solar panels and there were always enough amps for lights, instruments and gadget charging. However, we did not use a fridge, and modified our menu to avoid food needing refrigeration (though a bucket of sea water was good for cooling the beers). There are few shops in the archipelago and, knowing this, we brought lots of canned food and made fresh bread aboard. The thermal cooker was also well used- this was used for bread-making and also so a meal could be prepared in advance, rather than in the evening when we did not feel like cooking. It also saves on fuel for cooking. We travelled to most of the island groups in the central part of the archipelago. At first we kept exclusively to the buoyed channels, but as our confidence grew, we realised that Aurora’s shallow draught was ideal for travelling between the island groups. The advice to “sail in the white parts” of the chart proved very useful and the accuracy of huge Navionics electronic charts was reassuring, though we always kept a wary eye out for uncharted rocks. The archipelago is an ideal cruising ground for the Cape Cutter. It provides numerous island groups with good distances between for cruising. There was always a sheltered anchorage and the quantity of islands meant that there was always a destination which suited the wind direction. Each island has its own character, with different topology and vegetation. Would I carry out such a trip again? Of course! I’m already thinking about locations for he next cruise…. Last night was our only night in a marina or “Gasthamn”. We made good use of the included hot showers, wifi and mains hookup. Walking back along the pontoon from my shower, I was amazed by an incredible sight- a large liner gliding past the marina in the dark, heading for the sea. The channel is narrow at Furusund; certainly narrower than the length of the ship and it passed within a couple of hundred metres from us with barely a ripple reaching us (there’s an 8kt limit in this part of the channel). It was huge- I counted ten decks above the waterline. All of them were lit up and I could hear only the sound of people aboard enjoying the evening- restaurant sounds, a band, people talking. No sound of engines, the large ship seeming to just glide by. A majestic sight. We were woken this morning by loud conversations in what sounded like Arabic; a pretty odd thing, which caused me to poke my head through the hatch. A group of men were rod and line fishing and rapidly filling buckets with perch caught using worms from a bucket of soil they had brought with them. 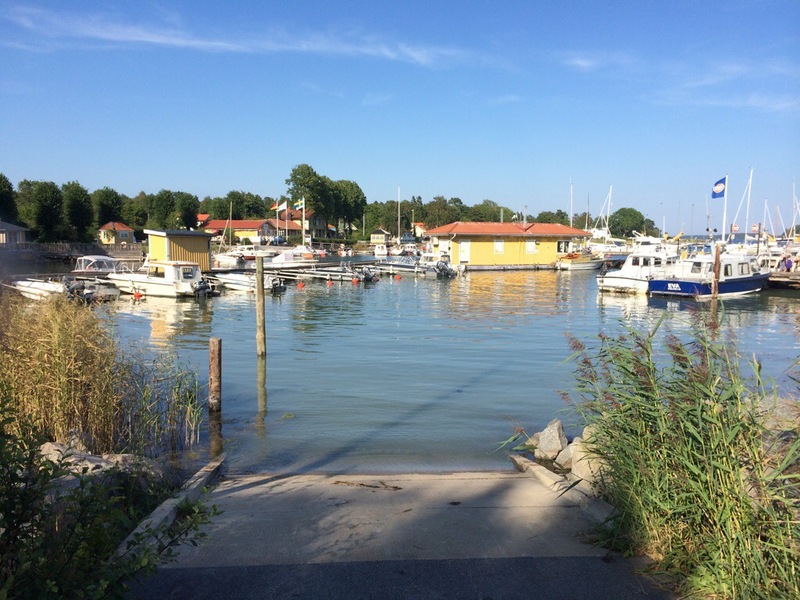 After a breakfast of fil mjolk (a type of yogurt, though a different culture to what I’m used to at home) and boat bread, we walked from Furusund to fetch the van and trailer from Högmarsö. Whilst we were waiting for the ferry to that island, we got chatting to a man waiting with his car, who had a summer house on Högmarsö. He told us that the ferry is owned and run by a collective of people with property on the island. Though it’s only a couple of miles long, about 30 people live full time there, with about 10x that having second homes there. He said that the ferry (and road) are subsidised about 75% by the Swedish government. The ferry into the island is free, but a ticket is needed to leave, a detail I had not noted till he pointed it out. He said that they are worried in that area about criminals from the Eastern Baltic states and that having to buy a ferry ticket, inspected by the ferry man (who knows most of thx locals), might help to keep the burglars away. Anyway, he offered a lift the rest of the way to the harbour, which Aimee was happy to accept. When we got back to the slipway in Furusund, things were quite busy with boats being launched and recovered. However we soon got a slot. The ramp was good concrete and very steep, so I dispensed with a rope and reversed the trailer till the van wheels were at the waters’ edge. With no tides, there was none of the slime I’m used to encountering on slipways. Whilst Aimee minded the van, I trotted round to the boat and, after one false start, got Aurora on the rollers- the trailer was plenty deep enough. However to my annoyance, someone had pinched my winch handle- a spanner was pressed into service (literally) to solve that problem. By this time, we had am audience. None of the onlookers had seen a sailing boat recovered here before, and I soon realised why. What I had not taken into account was a phone line running across the top of the slip. 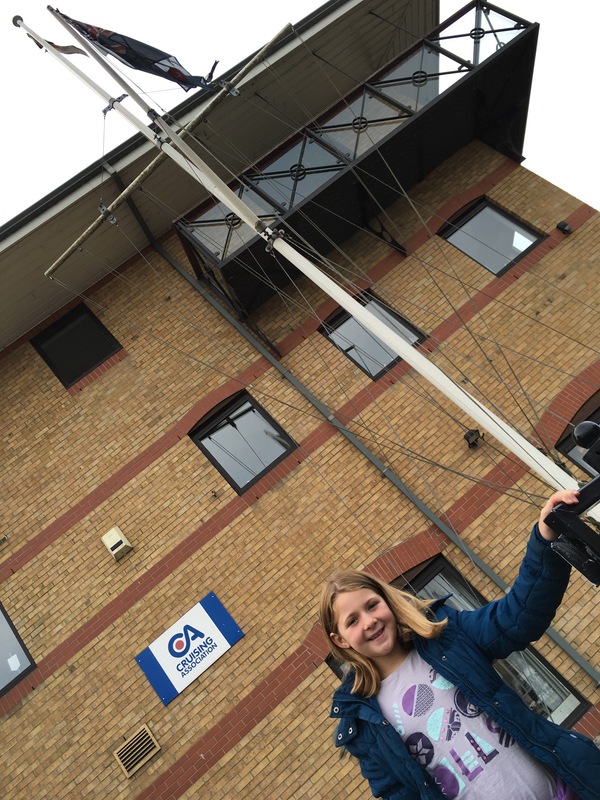 So, with many pairs of eyes watching, Aimee and I dropped the mast on the slipway in double quick time and Aurora was finally hauled clear of the water. I had done quite a lot of de-rigging the evening before, so there was less than usual to do. Aimee made herself useful and we were soon ready for the road- 300 miles to Gothenburg for the ferry to Tilbury. This photo taken last week- I had no time to take any photos whilst we were hauling out today! You can just see the phone cable in the picture above, a detail I missed when I took the picture….